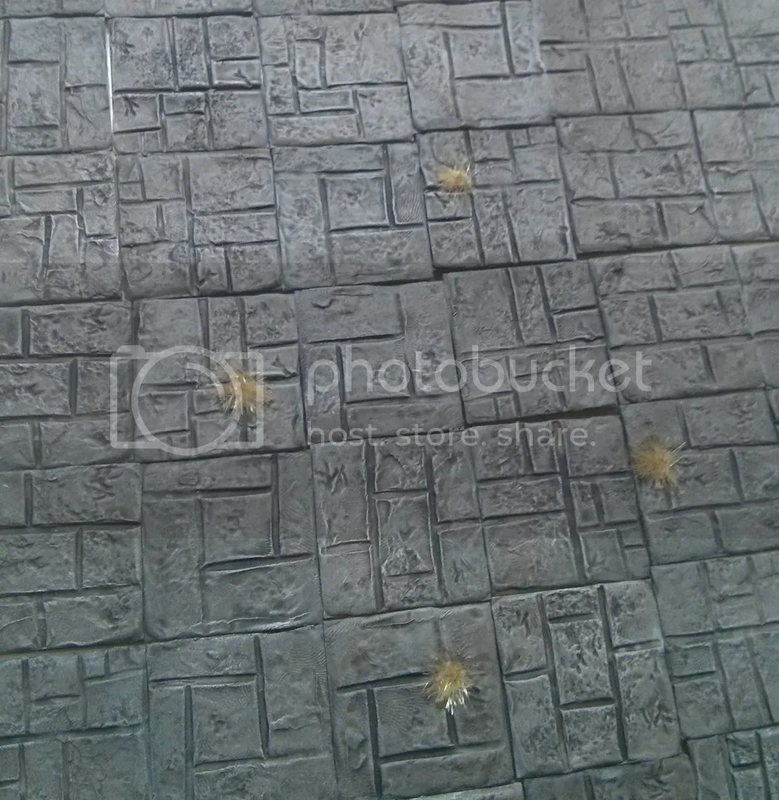 So far if you’ve followed the steps in tutorials 1 – 3 you will have gone through sculpting a master, using this to make a mold from insta-mold, then casting a bunch of tiles. This is what I’m hoping will be my opening fluff for the game. Page one of the rule book kind of material. Nah listen up you’ze lot. ‘Undreds o’ cycles ago, a species known as ‘Oomans was da dominant players on Orkney. It’s said dat dey ‘ad conquered da land and da sea, and dat dere cities even challenged da glory of da Gods. Da ‘Oomans wasn’t big n tough like an Orc, but dey were wry and chock full o more cunning dan a bag of Goblins wiv gearsticks. Dese folk managed to exist in peace wiv us Orcs for many a cycle until dey discovered da Magika. It began wiv expansion, it always does – new ideas need more room see? An’ when da Orcs refused to give up lands and sacred sites dat had been guarded for generations, da ‘Oomans got twisted out o shape. Well, I’ze don’t need to tell you’ze dat an Orc is not shy of a scrap. All da tribes united under one banner and waged all out war on da ’Oomans. Dis was not an easy fight, da ‘Oomans had powerful machines made of iron and timba, and burnin’ magika than could level an entire forest o’ oaks. We’ze ‘ad to employ sneaky gorillas tactica usin’ small groups of shock troops and the elemunt o’ suprise. You know what an Orc sez when ee’s bein’ suprizin? Nah, you wouldn’t. No onez lived to tell da tale ya see? Anywayz, after a long and damaging war, we’ze finally managed break da back o’ the ‘Ooman forces and after deliberatin’, we swept over dere great cities too, killin’ all dat we found. Da ‘Oomans couldn’t be trusted, an’ we couldn’t allow dem to get powerful again. When it were all over, as is our way, we collected up da corpses of da most worvy foes an’ we laid dem to rest in a great series o’ dungeons and catacombs. Den for good measure, we’ze set guards at the gates to stop anyone tresspassin’. Ok, so this is not technically brand shiny new. I’ve been working on this for about a month or so – but that was before I had this blog so technically I can get away with calling it new, see? So I’m going to start posting some design decisions up, and a few pictures of the terrain, Tokens, and models I’ve been putting together. Hopefully you’ll be able to follow my progress as we go along, but first I’ve got to catch you up a bit right? Here’s a shot of some of the prototype pieces I’ve got so far. 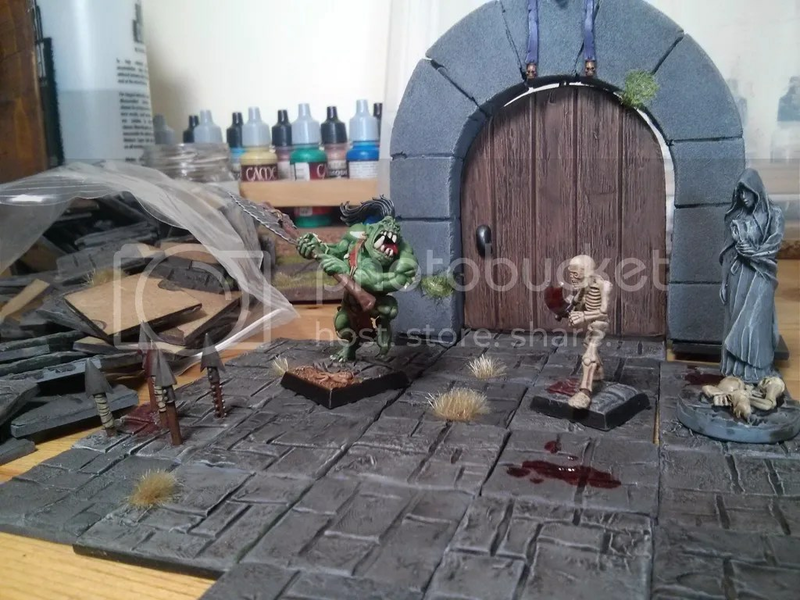 I didn’t sculpt the models, but I made the tiles and door from scratch, and did all my own painting. I think I’ll talk a bit about the Ork warrior, then that’ll do for this post. His name is “Gorgo the Obliterator” and if you ever played an online MMORPG then he’s what you’d describe as a tank. In the game, his role will be to attract the attention of the enemy and take all the hits to protect the much more fragile shaman and thief characters. That doesn’t mean he can’t deal out damage though, he’s quite proficient at battle as is fitting for an Ork of his stature, and his limit breaks (think Final Fantasy 7) are pretty devastating. He can also equip the heaviest armour and weapons which helps him to shrug of the massive amount of damage that’s going to be chucked in his direction. Fluff wise, he’s the son of a village chief assigned to protect the shaman on his pilgrimage to the local catacombs. I’m still fleshing this fluff out but I’ll chuck up another post in a minute which contains what I’m imagining as my rule book’s opening fluff. Hopefully that should set the scene for you a bit better.